The Department of Neurosurgery at the PAN Clinic on Neumarkt is staffed by top-class specialists in the field of diagnosis and treatment of acute and chronic neurosurgical diseases. The department is headed by Prof. Dr. med. Roland Goldbrunner. Within the framework of the Medical Service Center (MSC) at the University Hospital Cologne, the Department of Neurosurgery offers comprehensive counseling and an individualized approach to the treatment of specific tumors, vascular and cerebrospinal diseases. The main focuses of the department include the treatment of various brain diseases and diseases of the spine. Both experience and competence of the neurosurgical university hospital allow the specialists of the department to offer patients a solution of their problems at the highest possible level. Studied Medicine in Regensburg and Würzburg. Clinic and Polyclinic of Neurosurgery at the University of Würzburg. Laboratory for Neuro-Oncology in Washington, D.C. Neurosurgical Clinic at the Ludwig-Maximilians-University Munich. 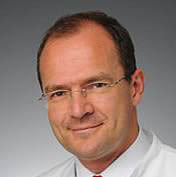 In 2009, Prof. Dr. Goldbrunner joined the University of Cologne and is now the Chief Physician of the Сlinic of General Neurosurgery and Managing Director of the Center for Neurosurgery.